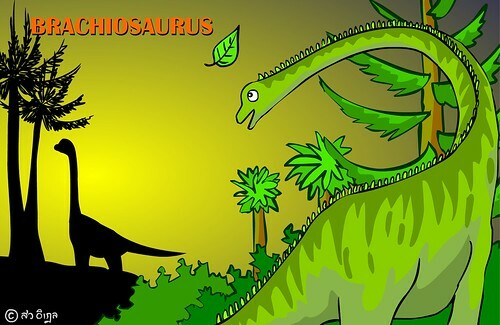 Branchiosaurus had a long neck, long tail as cedar tree (mentioned in Old Testament) and heavy body. It needed to spend whole day to find the food to keep itself alive. Its pin teeth show that it did not chew before swallow. This means its stomach could digest the leaves directly. Roll mouse over the black shard dinosaur, you will see how it eats plant. Eye of the big dinosaur will look at your mouse which is its food.